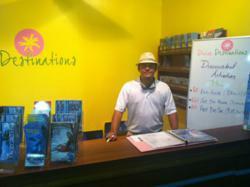 Divine Destinations, a travel company located in the Downtown Shopping District of Charlotte Amalie, St Thomas in the U.S. Virgin Islands continues to grow and develop. This company has already become a recognized image of professionalism and integrity in the downtown area. But now, they are expanding their reach with a new location. After following US Virgin Islands Port Authority procedures, and meeting their requirements, Divine Destinations has now acquired a booth inside the Red Hook Ferry Terminal. This will develop new opportunities for growth for Divine Destinations, allowing them to continue generating new jobs for the community and improving the overall experience of our Vacationers. This also shows that the diligence and professional of this company has again, been recognized by the leaders of our community. The company is very thankful for this new opportunity and extremely proud of their team.